The new GPS ground control system’s cascading delays and ballooning budget have the Department of Defense (DoD) looking at other options, including shifting to an enhanced version of an existing control system, Inside GNSS has learned. The Next Generation Operational Control System (OCX), which already has more than doubled in cost, will be the focus of a second “Deep Dive” review before the DOD’s top acquisition official on December 4. Frank Kendall, the under secretary of defense for acquisition, technology, and logistics (USD/AT&L), will look at the program for the second time this year, assessing a revised OCX schedule and a program budget that may top the current estimate of nearly $2 billion. He will also weigh whether measures taken over the last two years have fixed fundamental problems with the program’s approach to planning, system design, and cybersecurity. “USD(AT&L) recognized at the February 2015 Deep Dive that OCX still needed DOD attention to determine if recent actions have checked negative trends. A second Deep Dive has been scheduled for December and will be significant for defining OCX’s path forward,” Maureen Schumann, Kendall’s spokeswoman, said in a statement. McCain, however, really didn’t raise any new facts about the program, which has struggled for years. The lawmaker’s two-page write-up, released October 16, was drawn from a long-in-coming Government Accountability Office (GAO) report jointly requested by McCain’s committee and its House counterpart the year before. 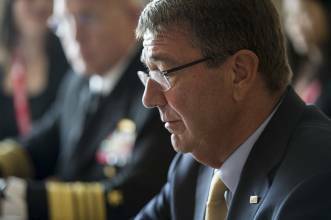 As it happened, the “Most Wasted” critique was released five weeks after the GAO report but a week ahead of President Obama’s veto of the National Defense Authorization Act (NDAA) — a veto McCain had decried but the White House made very clear was coming because the president disagreed with lawmakers’ approach to expanding DoD’s budget. Fortunately for OCX and its prime contractor Raytheon, the politics of defense spending may now be a little bit easier. Congress and the White House reached a budget deal that raised defense spending by $40 billion for this fiscal year and $15 billion for FY17 — taking some of the pressure off defense programs including OCX. The U.S. House of Representatives approved the budget measure on Wednesday (October 28, 2015), and the Senate was expected to pass the measure as well. The contract has been on rocky ground from the beginning. The GAO described a string of costly missteps that started with the Air Force launching the program before fully understanding its requirements. In 2010, when Raytheon was awarded the contract, the new ground system was expected to cost $886 million and be completed in six years. OCX Block 1, which is needed for command and control of the new GPS Block III satellites and the modernized signals that they transmit, was to have been completed in August 2015. Block 2, which is necessary for the more secure and jamming-resistant M Code signal, was to have been delivered in 2016. The project is now expected to cost an additional $1 billion and take another four years. Block 0 supports the launch and initial testing (checkout) of the GPS III satellites. The current ground control structure does not support GPS III. With Block 1, command and control of the GPS constellation transitions to OCX, with the exception of the remaining few IIA satellites. The IIAs are the oldest of the GPS spacecraft and past their design life. Block 1 is necessary for the integration of the GPS III spacecraft and for control of the modernized GPS signals (L1C, L2C, L5) and the core capability of the military M-code (L1M, L2M). Block 2 expands the constellation’s capabilities, adding NAVWAR and civil signal monitoring, and enhancing M-code. And those schedule and budget estimates are likely to change. The Air Force, which has been criticized for developing overly optimistic schedules for the program, is working with Raytheon to develop a more realistic timetable. “The schedule that we’re putting together with the Air Force is not going to be a rosy-eyeglass schedule,” Matt Gilligan, Raytheon’s vice-president for navigation and environmental solutions, told Inside GNSS. It will take into account the history of the program and experience gained on other comparable programs, he said, and include “sufficient margin” to allow for unforeseen problems. “This is still a large complex program and the schedule needs to have allowances for that,” he added. The problems with scheduling and reporting — plus several changes to requirements that triggered rework and altered the program’s trajectory mid-stream — were underscored by GAO auditors. They also noted that OCX had not gone through a preliminary design review before the contract was awarded — a process that can catch problems early on. GAO also highlighted a very poor understanding of the Information Assurance (IA or cybersecurity) requirements by program managers, including whether or not commercial, legacy and open-source software being incorporated into the OCX system had to be scanned for IA compliance under the contract. Although that issue has been settled, and the scans are now is being done by Raytheon, the shortcoming was not even discovered until August 2012, GAO reported. Mounting problems forced the Air Force to halt work on OCX in 2013 so that managers could take a step back and fix the program’s foundations. “We paused further development for the next iteration, 1.6, until we revalidated and completed a systems engineering baseline for the balance of the program,” explained Gilligan. That involved going through more than 12,000 systems engineering documents, he said, validating those documents and crosschecking everything. Not only did the system’s blueprint need to be fixed, the network of computers on which software was being tested had to be updated to make the hardware and software consistent across the system. The Air Force had tried to avoid this expense, but the resulting hodgepodge significantly slowed the program and made updates difficult. An Air Force Acquisition Incident Review (AIR) report released just two weeks after the GAO made its findings public found many of the same shortcomings, including a schedule that was unrealistic from the start and inconsistent with similar programs — even after being adjusted. The AIR said Raytheon had performed poorly but also noted that most of the government team managing the contract, including the program manager and both the system program office’s director and chief engineer, had left within six months of the contract award. Moreover, the contract’s incentive structure “drove unintended consequences,” the Air Force found, pushing Raytheon into taking shortcuts that resulted in “significant” errors and software rework. Gilligan asserted that the changes to the OCX development effort over the last two years have sharply reduced programmatic risks. OCX has since passed the critical design review for iteration 1.6, its next block of coding, he said, closing out that step on October 1. Gilligan acknowledged that the Air Force was examining alternatives to OCX, including enhancing the cybersecurity on “an existing system.” He asserted, however, that shifting away from OCX would leave the Air Force shortchanged.